Himono is fish or shellfish that has been salted and dried, or simply dried. 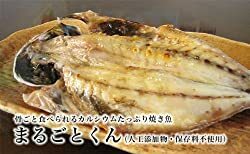 Horse mackerel, mackerel pike, Atka mackerel, and squid are among the fish most commonly eaten as himono. Drying preserves fish by removing water and allowing a protective film to form on the surface of the fish. It also imparts a texture different from that of fresh fish and enhances flavor. Himono can be made by using either sunlight or a machine for the drying process. Himono made by drying under the sun carry the characters, “天日干し,” which read “tenpin bosh,” on the package. Himono can be kept longer than fresh fish, but taste best when eaten soon after they are bought. Himono can also be frozen. If you freeze them, it is best to wrap them individually in plastic wrap.